Preface. Electricity simply doesn’t substitute for all the uses of fossil fuels, so windmills will never be able to reproduce themselves from the energy they generate — they are simply not sustainable. Consider the life cycle of a wind turbine – giant diesel powered mining trucks and machines dig deep into the earth for iron ore, fossil-fueled ships take the ore to a facility that will use fossil fuels to crush it and permeate it with toxic petro-chemicals to extract the metal from the ore. Then the metal will be taken in a diesel truck or locomotive to a smelter which runs exclusively on fossil fuels 24 x 7 x 365 for up to 22 years (any stoppage causes the lining to shatter so intermittent electricity won’t do). There are over 8,000 parts to a wind turbine which are delivered over global supply chains via petroleum-fueled ships, rail, air, and trucks to the assembly factory. Finally diesel cement trucks arrive at the wind turbine site to pour many tons of concrete and other diesel trucks carry segments of the wind turbine to the site and workers who drove gas or diesel vehicles to the site assemble it. Fossil fuels are essential for making wind turbines, as Robert Wilson explains in Can You Make a Wind Turbine Without Fossil Fuels? Oil is used from start to finish — from mining to crushing ore and smelting it, to delivery to the fabrication plant to the supply chains for 8,000 parts in a turbine to the final delivery site. Cement trucks drive to the delivery site over roads built by diesel powered road equipment, fossil made cement and steel rebar to pour the foundations wind turbines sit on, diesel trucks haul the components of the turbine to the installation place, and diesel cranes lift the turbine sections and 8,000 parts upward. There are no electric blast furnaces, only fossil fueled ones to make cement and most steel, nor are there electric mining trucks, electric long haul trucks to deliver the 8,000 parts made all over the world, electric cement trucks, electric cranes, and so on. That means even if a wind turbine could generate enough energy to replicate itself, it wouldn’t matter, the process from start to finish needs to be electrified. Not only would windmills have to generate enough power to reproduce themselves, but they have to make enough power above and beyond that to fuel the rest of civilization. Think of the energy to make the cement and steel of a 300 foot tower with three 150 foot rotor blades sweeping an acre of air at 100 miles per hour. The turbine housing alone weighs over 56 tons, the blade assembly 36 tons, and the whole tower assembly is over 163 tons. Florida Power & Light says a typical turbine site is 42 by 42 foot area with a 30 foot hole filled with tons of steel rebar-reinforced concrete –about 1,250 tons to hold the 300 foot tower in place (Rosenbloom). “The precise volume of fuel consumed when constructing and operating offshore wind farms significantly varies depending on vessel size, weather conditions, load, etc., but a jack-up vessel (used to install turbine foundations) uses approximately 2,640 gallons per day of marine fuel – or 63 barrels per day – according to guidance provided by consultancy BVG Associates. Constructing a 500 MW installation requires between 200 and 300 days of jack-up rig time, which means between 12,571 barrels (bbls) and 18,857 bbls of marine fuel consumed during construction. For comparison, Amtrak consumed about 1.6 million bbls of diesel fuel in 2014, according to the Bureau of Transportation statistics. So, the jack-up rig fuel requirements of building a 500 MW offshore wind farm account for 0.8% to 1.2% of the fuel annually consumed by Amtrak. See point #4 in Energy Overview. Oil is butter-fried-steak wrapped in bacon. Alternative Energy is lettuce. Consider the scale of trying to replace fossil fuels. Every hour 3.7 million barrels of oil are pumped from wells; 932,000 tons of coal are dug; 395 million cubic meters of natural gas are piped from the ground. In that same hour, another 9,300 people are added to the global population. By 2100, the world will be home to 11 billion of us (Jones Energy Policy). Consider just the wind power needed to replace offshore oil in the Gulf of Mexico: At 5.8 MBtu heat value in a barrel of oil and 3412 BTU in a kWh, 1.7 million barrels per day of gulf oil equals 2.9 billion kWh per day, or 1,059 billion kWh a year. Yet the total 2008 wind generation in Texas was 14.23 billion kWh, and 5.42 billion kWh in California. Which means you’d need 195 California’s, or 74 Texas’s of wind, and 20 years to build it (Nelder). And then start the process over every 20 years, the very short lifespan of wind turbines, when energy will be required to dismantle the old one and replace it with a new one (15 years for offshore wind turbines due to corrosion). Wind turbines come in many shapes and sizes, and their numbers are growing. Yet, they provide only 4.4 % of United States electricity, 181,791,000 MWh. That’s equivalent to the power generated by 32,428 2-MW wind turbines. To supply half of America’s power with wind, another 332,600 2-MW turbines are needed. 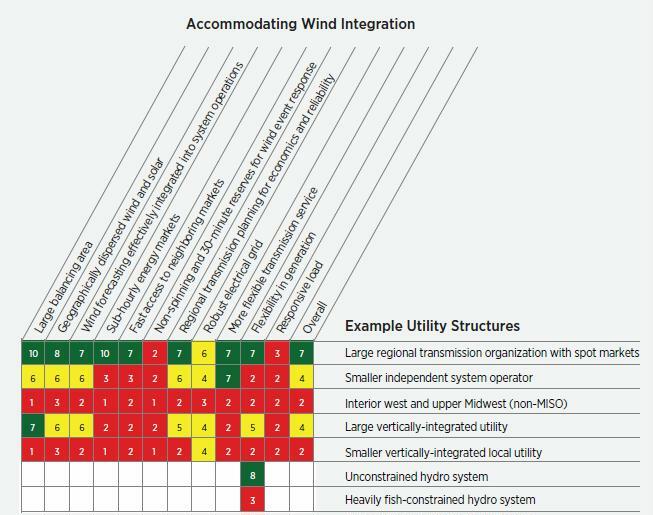 In the 11 states of the Western grid, if 35 % wind and solar were integrated, their intermittency would require 100 % backup from conventional sources such as natural gas and large hydro to maintain system reliability (NREL 2010a). So to get 100 % of electricity generation from wind, which is only blowing a third of the time on average (the capacity factor) requires building three times more reliable capacity to keep the system stable and backup wind when it isn’t blowing (CCST 2011). So our 365,000 wind turbines need to be multiplied by at least three (plus energy storage) for a grand total of 1,095,000 wind turbines in a mostly renewable grid, and somehow connect even the most distant wind turbines in the remote regions of the Great Plains. That seems like the game is stacked against wind and solar, and that someone is moving the goalposts. Why three times more capacity? Read on. The capacity factor is how much power is actually generated, which is always a fraction of the theoretical maximum amount of power that could be obtained if the wind always blew at the optimum speed or every day was the sunniest day of the year. Since the average wind capacity factor over a year is around 33 %, you need to build three times as much wind to provide power to the electric grid, and somehow connect them, if the goal is to replace nuclear and fossil generation, which theoretically could have 100 % capacity factors if grid operators chose to run them around the clock and needed no down time for maintenance. But that’s just an average, and there will be days when 300 % of what is needed would be generated and the excess would need to be stored or curtailed, and other days when less than 33 % was generated. The triple overkill is for reliability, to compensate for transmission losses, and make it more likely to have half of electricity power generation when needed. The record year for the most wind generation ever built in the U.S. was 2012, equivalent to 4819 2-MW turbines. If we tilted towards windmills and built that many a year starting in 2016, it would take 220 years to build 1,095,000 of them to generate half of our electricity. Since their life span is 20 years, even more time and windmills would actually be needed for construction (Davidsson et al. 2014). And these statistics are for the U.S. alone. Multiply by 10 or more to provide wind energy to the whole world. 2019: Since U.S. Production Tax Credits (PTCs) expire after 2020, there’s a race to install turbines before then, but supply chains can’t handle it – there aren’t enough gigantic cranes, special trucks to carry each segment of the turbine to the destination and accompanying highway escorts, increasing numbers of heavier parts, so up to a quarter of new wind energy capacity may be canceled or delayed (Munsell 2019). Rare metals, are RARE. China controls 95% of them, and Trump’s trade wars would be a great reason to withhold them from the U.S. They could become a problem even before oil decline makes all goods and services scarcer. Windmill Turbines depend on neodymium and dysprosium. Estimates of the exact amount of rare earth minerals in wind turbines vary, but in any case the numbers are staggering. According to the Bulletin of Atomic Sciences, a 2 megawatt (MW) wind turbine contains about 800 pounds of neodymium and 130 pounds of dysprosium. The MIT study cited above estimates that a 2 MW wind turbine contains about 752 pounds of rare earth minerals. Neodymium prices quadrupled this year, and that’s with wind still making up less than 3% of global electricity generation (Cembalest). Energy decline will make it more and more costly to build turbines as the price of oil becomes unaffordatb.e The word “wind” belies the fact that these machines are not light and airy. Nor easily popped up. Each 2-MW wind turbine weighs 3,375,000 pounds (Guezuraga 2012; USGS 2011), equal to 102 18-wheeler trucks. The wind may be free, but wind turbines surely are not. Check out these videos showing the enormous amount of material and fossil energy required to build just one windmill, and the pictures in this post which capture the 900 short tons of materials used per wind turbine. Now imagine 1,641,999 more of them for the United States alone to provide half our power. The limits to growth due to lack of material resources, especially rare earth metals for off-shore turbines (to reduce maintenance of gearboxes) would be reached long before then. The DOE estimates there are 18,000 square miles of good wind sites in the USA, which could produce 20% of America’s electricity in total. This would require over 140,000 1.5 MW towers costing at least $300 billion dollars, and innumerable natural gas peaking plants to balance the load when the wind isn’t blowing. Natural gas production is likely to peak as soon as 2020 and we don’t have the Liquefied Natural Gas (LNG) facilities to import natural gas (NG) from other countries, and NG is finite, and LNG even more so since it takes so much energy to chill it and keep it chilled at -260 F (-160 C), and the LNG ship burns 20% of the LNG fuel to deliver it (and some escapes as well along the way). There isn’t enough dispatchable renewable power from batteries, pumped hydro storage, biomass, or Compressed Air Energy storage to balance, provide peak power and store power for even one day of U.S. electricity generation (11.12 TWh). See my post on how seasonal wind is here. “The Wind Energy Association’s website deals with “the intermittency myth” by claiming that “there is little overall impact if the wind stops blowing somewhere—it is always blowing somewhere else”. True, but that “somewhere else” may be hundreds or thousands of miles away with no high-voltage transmission lines in between. A new worldwide system where wind would be the single largest source of electricity would require such vast intra- and intercontinental extensions of HV transmission lines to create sufficiently dense and powerful interconnections to deal with wind’s intermittency that both its cost and its land claims would be forbidding. “In places with abundant wind and solar resources, like Texas and California, the price of electricity is dipping more and more frequently into negative territory. In other words, utilities that operate big fossil-fuel or nuclear plants, which are very costly to switch off and ramp up again, are running into problems when wind and solar farms are generating at their peaks. With too much energy supply to the grid, spot prices for power turn negative and utilities are forced to pay grid operators to take power off their hands. That’s happened on about a dozen days over the past year in sunny Southern California, according to data from Bloomberg, and it’s liable to happen more often in the future. “In Texas, power at one major hub traded below zero for almost 50 hours in November and again in March,” according to the state’s grid operator. In Germany, negative energy prices have become commonplace, dramatically slashing utility revenues despite renewable energy subsidies that bolster electricity prices much more than in the United States. Most of the best wind in the U.S. will never be developed — it is too far from cities, too far from existing transmission lines to harvest, or offshore the west coast where the ocean is too deep to build windmills. Many sites with the nation’s best wind power resources have minimal or no access to electrical transmission facilities. The best wind is far from the electric grid, and remote wind farms often need millions, or even billions of dollars in transmission lines – an overall $8 billion dollar project will send power from a 2,100 MW $4 billion Wyoming wind farm, $1.5 billion for a new CAES facility in Utah — the only salt cavern west big enough to do this, and $2.6 billion to run 525 miles of transmission lines from Wyoming to Utah to California (DATC, Gruver). CAES are fossil fuel dependent — they’re basically a gas turbine that needs 40-60% less natural gas. The storage facility could yield 1,200 MW of electricity, enough to power 1.2 million California homes. So whatever happened to the other 900 MW generated by the wind farm? Add on operation and maintenance costs, the short longevity of a wind farm — 20 years at best — and the fossil fuel energy to fabricate all this steel, cement, aluminum, power the CAES, etc., and you have to wonder how sustainable “wind” power really is when it’s so fossil fuel dependent. Just as oil doesn’t do much useful work when not burned within a combustion engine, wind needs a vast, interconnected grid or immense energy storage technologies (batteries, natural gas combustion turbines, etc). The larger the grid, the more wind that can be added to it. But we don’t have that infrastructure — indeed, what we do have now is falling apart due to deregulation of utilities, with no monetary rewards for any player to maintain or upgrade the grid. Most of the really good, strong wind areas are so far from cities that it’s useless because the energy to build a grid extending to these regions would use more energy than the wind would provide. Sure, oil and natural gas require pipelines too, but they’re already in place, built back when the EROEI of oil was 100:1 — though. We now turn to the matter of adequate interconnections, which in theory looks fairly promising. A study by the National Renewable Energy Laboratory found that the United States has 175 GW of potential wind capacity located within 5 miles of existing lines carrying up to 230 kV, 284 GW within 10 miles of such lines, and 401 GW within 20 miles of such lines.35 But what matters more than distance to the nearest transmission line is that line’s capacity, and in this respect it is obvious that the situation in the United States is much inferior to that in Europe. Europe has strong and essentially continent-wide north–south as well as east–west connections, while the United States does not have a comparably capable national network: high-voltage connections from the heart of the continent, where the wind potential is highest, to either coast are minimal or nonexistent. Consequently, the Dakotas could not become a major supplier to California or the Northeast without massive infrastructural additions. Jacobson and Masters argue that with an average cost of $310,000/km (an unrealistically low mean; see the next section), the construction of 10,000 km of new HV lines would cost only $3.1 billion, or less than 1 percent of the cost of 225,000 new turbines, and that HV direct current lines would be even cheaper.36 As with any entirely conceptual megaproject, these estimates are highly questionable; moreover, such an expansion is not very likely, given that the existing grid (aging, overloaded, and vulnerable) is overdue for extensive, and very expensive, upgrading,37 and that securing rights of way may be a greater challenge than arranging the needed financing (Smil 2010). According to Eon Netz, one of the four grid managers in Germany, for every 10 MW of wind power added to the system, at least eight MW of back-up power must also be dedicated. So you’re not saving on fossil fuels and often have to ADD fossil fuel plants to make up for the wind power when the wind isn’t blowing! In other words, wind needs almost 100% back-up of its maximum output. Denmark is often pointed out as a country that scaled wind up to provide 20% of its power. Yet because wind is so intermittent, no conventional power plants have been shut down because they need to step in when the wind isn’t blowing (enough). The quick ramping up and down of these power plants actually increases greenhouse gas emissions. And when the wind does blow enough, the power is surplus and most is sold to other countries at an extremely cheap price. And often the Danes have to import electricity, paying the highest electricity prices in Europe. The actual capacity is 20%, not the 30% the BWEA and AWEA claim is possible (Rosenbloom). Power struggle: Green energy versus a grid that’s not ready. Minders of a fragile national power grid say the rush to renewable energy might actually make it harder to keep the lights on. Evan Halper, Dec 2, 2013. Los Angeles Times. The grid is built on an antiquated tangle of market rules, operational formulas and business models. Planners are struggling to plot where and when to deploy solar panels, wind turbines and hydrogen fuel cells without knowing whether regulators will approve the transmission lines to support them. Energy officials worry a lot these days about the stability of the massive patchwork of wires, substations and algorithms that keeps electricity flowing. They rattle off several scenarios that could lead to a collapse of the power grid — a well-executed cyberattack, a freak storm, sabotage. But as states race to bring more wind, solar and geothermal power online, those and other forms of alternative energy have become a new source of anxiety. The problem is that renewable energy adds unprecedented levels of stress to a grid designed for the previous century. The first chart below is the “Mona Lisa” of wind unreliability, measured at one of California’s largest wind farms. The second is from the California Independent System Operator, showing how wind power tends to be low when power demand is high (and vice-versa). Wind should play an important role, but unless there is a high-voltage, high-capacity, high-density grid to accompany it (as in Northern Europe), or electricity storage, the variability of wind means that co-located natural gas peaking plants are needed as well. The cost of such natural gas plants are rarely factored into the EROI or LCOE costs of wind (Cembalest). To keep the grid from crashing, it has to be kept within a narrow range. To do this, about 10% of the electricity on the grid is never delivered to a customer, it’s there to balance the flow so that surges don’t cause blackouts leading to the loss of power for millions of people. Engineers carefully calibrate how much juice to feed into the system. The balancing requires painstaking precision. A momentary overload can crash the system. Wind and solar generate just a tiny amount of energy now, but at some point their unpredictability, surges to nothingness, and intermittency will be too large a percent of the grid to manage, and crash the grid. Wind speed matters. Wind power increases with the cube of the wind speed. Doubling the wind speed gives eight times more wind power. Therefore, the selection of a high-wind-speed location is very important. For example, the difference between wind blowing at 10 mph and 12.6 mph is 100% (IEC). Clearly wind farms built where wind speeds are class 4 or higher will be more profitable. California, Oregon, and Washington have already built out their best class 4+ resources. It could take 10 years to never — if there were another financial crash or fossil fuels were declining and allocated mainly to agriculture and emergency services (DOE) — to build out transmission lines to remote high-wind areas before wind farms could be built. As it is, a great deal of wind farms wouldn’t be built without subsidies. Warren Buffet has said that he only invests in wind energy because “we get a tax credit if we build a lot of wind farms. That’s the only reason to build them. They don’t make sense without the tax credit” (Pfotenhauer). Todd Kiefer: Just crunched an “EIA report to Congress on energy subsidies (http://www.eia.gov/analysis/requests/subsidy/pdf/subsidy.pdf). In 2010 wind was subsidized at 2.16 cent/kWh and solar at 3.13 cent/kWh. In 2013 (latest data available), wind was subsidized at 1.31 cent/kWh and solar at 6.36 cent/kWh. Makes it easier to see why there are solar PPAs out there for 4 cent/kWh. Mining 1 ton of rare earth minerals produces about 1 ton of radioactive waste, according to the Institute for the Analysis of Global Security. In 2012, the U.S. added a record 13,131 MW of wind generating capacity. That means that between 4.9 million pounds (using MIT’s estimate) and 6.1 million pounds (using the Bulletin of Atomic Science’s estimate) of rare earths were used in wind turbines installed in 2012. It also means that between 4.9 million and 6.1 million pounds of radioactive waste were created to make these wind turbines — more than America’s nuclear industry, which produces between 4.4 million and 5 million pounds of spent nuclear fuel each year. Yet nuclear energy comprised about one-fifth of America’s electrical generation in 2012, while wind accounted for just 3.5 percent of all electricity generated in the United States. The environmental impact of mining the rare metals required for windmills makes their use questionable. Mongolia has large reserves of rare earth metals, especially neodymium, the element needed to make the magnets in wind turbines. Its extraction has led to a 5-mile wide poisonous tailings lake in northern China. Nearby farmland for miles is now unproductive, and one of China’s key waterways is at risk. “This vast, hissing cauldron of chemicals is the dumping ground for seven million tons a year of mined rare earth after it has been doused in acid and chemicals and processed through red-hot furnaces to extract its components. Rusting pipelines meander for miles from factories processing rare earths in Baotou out to the man-made lake where, mixed with water, the foul-smelling radioactive waste from this industrial process is pumped day after day” (Parry). Like solar, wind accounts for only a tiny fraction of renewable energy consumption in the United States, about a tenth of one percent, and will be hard to scale up in the short time left. EIA. June 2006. Renewable Energy Annual. Only the winds moving in the lowest few hundred meters above the surface can be intercepted. All the wind above a windmill is now unavailable. And only 59% of wind can ever be captured, no matter how well-built a wind turbine is according to Betz’s law. Windmill “kites” were proposed decades ago, but are unlikely to work out, winds can be too strong, difficult to take down before a hurricane, tornado, or large storm, kites could fall onto developed areas, airplane traffic would need to be rerouted, and the line from the kite to the electricity generator likely to be too heavy for the kite, or short-circuit if too thin. There are several research groups looking at generating electricity using giant kites up in the jet stream. But it won’t be easy. Jet streams move around and change their location, airplanes need to stay well away, and lightning and thunderstorms might require them to be brought down. The strongest wind is 6 miles above us, where winds are typically 60 miles per hour. Some scientists think there’s enough wind to generate 100 times current global energy demand. But Axel Kleidon and Lee Miller of the Max Planck Institute for Biogeochemistry believe that’s a massive overestimate of the amount of energy that could be obtained. If they’re right that jet stream wind results from a lack of friction, then at most 7.5 TW of power could be extracted, and that would have a major effect on climate (Earth System Dynamics, vol 2, p 201). Globally we use about 12 terawatts of energy a year. There’s 85 terawatts of wind, but most of it is over the deep ocean, or the many miles above, which we are unlikely to ever capture. And on top of all these problems, windmills are built to capture wind only at certain ranges of speeds, so when the wind is too light or too strong, power is not generated. Scientists do not know the maximum share of global atmospheric circulation that could be converted into electricity without changing the earth’s climate. Models of atmospheric circulation indicate that the very large-scale extraction of wind (requiring installed capacities on a TW scale needed to supply at least a quarter of today’s demand) reduces wind speeds and consequently lowers the average power density of wind-driven generation to around 1 W/m2 on scales larger than about 100 km (Smil). The maximum extractable energy from high jet stream wind is 200 times less than imagined initially, and trying to extract them would profoundly impact the entire climate system of the planet. If we tried to extract the maximum possible 7.5 TW from the jet stream, “the atmosphere would generate 40 times less wind energy than what we would gain from the wind turbines, resulting in drastic changes in temperature and weather” according to Lee Miller, the author of the study (Miller). Scientists modeled the impact of a hypothetical large-scale wind farm in the Great Plains. Their conclusion in The Journal of Geophysical Research, is that thousands of turbines concentrated in one area can affect local weather, by making warmer drier conditions from the atmospheric mixing in the blades wake. The warming and drying that occur when the upper air mass reaches the surface is a significant change, Dr. Baidya Roy said, and is similar to the kinds of local atmospheric changes that occur with large-scale deforestation (2Nov 2004. Catch the Wind, Change the Weather. New York Times. “We shouldn’t be surprised that extracting wind energy on a global scale is going to have a noticeable effect. … There is really no such thing as a free lunch,” said David Keith, a professor of energy and the environment at the University of Calgary and lead author of a report in the Proceedings of the National Academy of Sciences. Specifically, if wind generation were expanded to the point where it produced 10% of today’s energy, the models say cooling in the Arctic and a warming across the southern parts of North America should happen. The exact mechanism for this is unclear, but the scientists believe it may have to do with the disruption of the flow of heat from the equator to the poles. Researchers found that a high amount of wind power could mean more climate warming regionally and in the decades ahead, raising serious questions about how much nations should look to wind power to clean up electricity systems. The study, published in the journal Joule, found that if wind power supplied all US electricity demands, it would warm the surface of the continental United States by 0.24 °C. That could significantly exceed the reduction in US warming achieved by decarbonizing the nation’s electricity sector this century, which would be around 0.1 °C. Our analysis suggests that it may make sense to push a bit harder on developing solar power and a bit less hard on wind, since the warming effect from wind was 10 times greater than the climate effect from solar farms, which can also have a tiny warming effect. Large wind farms with a high density of installed capacity slow down the wind and generate less electricity than previously thought Image Large wind farms with a high density of installed capacity slow down the wind and generate less electricity than previously thought. Less energy can be withdrawn from wind than was assumed up to now. For example, a previous prediction from a 2013 study by the German Federal Environmental Agency concluded that almost seven watts of electrical power per square meter could be generated from wind energy. However, an international research team led by scientists from the Max Planck Institute for Biogeochemistry in Jena has now shown that the amount of energy actually possible from wind power is considerably lower. These researchers calculated that a maximum of 1.1 watts of electricity could be generated per square metre over a large (105 km2) wind farm in the windy state of Kansas, United States (Miller 2014). In 2018, just 9 states accounted for 74% of wind generation. So the dreams of other states going 100% renewable is a dream, they don’t have the wind to do that, and quite possibly not enough sunshine either to add more solar power — 9 states account for 88% of solar generation (Gattie 2019). The wind needs to be at least force level 4 (13-18 mph) for as much of the year as possible to make it economically possible. This means that a great deal of land is not practical for the purpose. The land that is most suitable already has windmills, or is too far from the grid to be connected. A Class 3 windmill farm needs double the number of generators to produce the same amount of energy as windmills in a class 6 field (Prieto). Without a vastly expanded grid to balance the unpredictability of wind over a large area, and across seasons, wind can’t provide a significant portion of electrical generation. But expanding the grid to the proper size would cost trillions of dollars. NIMBY has stopped this from happening, will continue to provide opposition, and states don’t like transmission lines to cross their borders. So it is very unlikely we will ever have a national grid, which would also make us more vulnerable to terrorism, accidents, and can actually be less, not more stable than the regional grids we have today. Much of the land in the USA (the areas where there’s lots of wind) is quite far from population centers. And when you hook windmills to the grid, you lose quite a bit of energy over transmission lines. It also takes a lot of energy to build and maintain the electric grid infrastructure itself. Remote wind sites often result in construction of additional transmission lines, estimated to cost as much as $300,000-$1 million per mile. (Energy Choices in a Competitive Era, Center for Energy and Economic Development Study, 1995 Study, p. 14). The economics of transmission are poor because while the line must be sized at peak output, wind’s low capacity factor ensures significant under-utilization. In Denmark, where some of the world’s largest wind farms exist, wind blows the hardest when consumer demand is the lowest, so Denmark ends up selling its extra electricity to other countries for pennies, and then when demand is up, buys electricity back at much higher prices. Denmark’s citizens pay some of the highest electricity rates on earth (Castelvecchi). In Texas and California, wind and solar are too erratic to provide more than 20% of a regions total energy capacity because it’s too difficult to balance supply and demand beyond that amount. Wind varies greatly depending on the weather. Often it hardly blows at all during some seasons. In California, we need electricity the most in summer when peak loads are reached, but that’s the season the least wind blows. On our hottest days, wind capacity factors drop to as low as .02 at peak electric demand. At a time when the system most needs reliable base load capacity, wind base capacity is unavailable. We don’t have EROEI-positive batteries, compressed air, or enough pumped water dams to store wind energy and concentrate it enough to do useful work and generate power when the wind isn’t blowing. There are no power to gas, hydrogen, or any other fantasy storage methods even close to commercial development. Nor are there ever going to be storage methods that can return the same amount of energy put into them, so having to store energy reduces the amount of energy returned. Compressed air storage is inefficient because “air heats up when it is compressed and gets cold when it is allowed to expand. That means some of the energy that goes into compression is lost as waste heat. And if the air is simply let out, it can get so cold that it freezes everything it touches, including industrial-strength turbines. PowerSouth and E.ON burn natural gas to create a hot gas stream that warms the cold air as it expands into the turbines, reducing overall energy efficiency and releasing carbon dioxide, which undermines some of the benefits of wind power” (Castelvecchi). Japan’s biggest wind power supplier, may scrap a plan to build turbines on the northern island of Hokkaido after the regional utility cut proposed electricity purchases, blaming unreliable supply. Power surges can be a problem for industrial customers, said Hirotaka Hayashi, a spokesman at Hokkaido Electric. Utilities often need to cut back power generation at other plants to lessen the effect of excess power from wind energy. To ensure steady supply, Tohoku Electric Power Co., Japan’s fourth-biggest generator, in March started requiring owners of new windmills to store energy in batteries before distribution rather than send the electricity direct to the utility, said spokesman Satoshi Arakawa. That requirement has increased wind project installation costs to 300,000 yen ($2,560) per kilowatt, from 200,000 yen, according to Toshiro Ito, vice president of EcoPower Co., Japan’s third-biggest wind power supplier (Takemoto). If the energy costs of intermittency, back-up conventional plant, and grid connection were added to the “cost” of windfarms, the EROEI would be far lower than current EROEI studies show. Wind farms require vast amounts of steel and concrete, which in terms of mining, fabrication, and transportation to the site represent a huge amount of fossil fuel energy. The Zond 40-45 megawatt wind farm is composed of 150 wind turbines weighing 35 tons each — over 10 million pounds. The 5,700 turbines installed in the United States in 2009 used 36,000 miles of steel rebar and 1.7 million cubic yards of concrete (enough to pave a four-foot-wide, 7,630-mile-long sidewalk). The gearbox of a 2-megawatt wind turbine has 800 pounds of neodymium and 130 pounds of dysprosium — rare earth metals that are found in low-grade hard-to-find deposits that are very expensive to make. (American Wind Energy Association). Materials like carbon fiber that would make them more efficient cost several times more and use up a great deal more fossil fuel energy to fabricate than a fiber glass blade. From the mining of the metals to make windmills, to their fabrication, delivery, operation, to their Maintenance is very dependent upon fossil fuel energy and fossil fuel driven machinery. Wind energy at best could increase the amount of energy generated while fossil fuels last, but is too dependent on them to outlast the oil age. After a few years, maintenance costs skyrocket. The larger the windmill, the more complex maintenance is needed, yet the larger the windmill, the more wind can be captured. A wind farm takes up 700 times more land to produce the same amount of energy from wind as from natural gas. And land is, in fact, scarce. We use 40% of the world’s land for farming, and as the human population grows, we will need to produce 50% more calories by 2050 (Shellenberger 2019). A 50 megawatt wind farm can take up anywhere from two to twenty-five square miles (Proceedings of National Avian-Wind Power Planning Meeting, p. 11). Vast amounts of land are required for wind turbines, which have to be spaced far apart since on the other side of a windmill that has just “captured” wind, there’s no wind left. For example, if the best possible wind strip along the coast between San Francisco and LA were covered with the maximum possible number of windmills (an area about 300 miles long by one mile deep) you’d get enough wind, when it was blowing, to replace only one of the dozens of power plants in California (Hayden). Development of a wind power plant results in a variety of temporary and permanent disturbances, including land occupied by wind turbine pads, access roads, substations, service buildings, and other infrastructure which physically occupy land area, or create impermeable surfaces. Additional direct impacts are associated with development in forested areas, where trees must be cleared around each turbine. Land modified for wind farms represents a potentially significant degradation in ecosystem quality (Arnett). Supplying half of today’s electricity—that is, about 9 PWh—by wind would thus require about 4.1 TW of wind turbines; with 2 W/m2, they would claim about 2 million km2 (772,204 square miles), or an area roughly four times the size of France or larger than Mexico. With average power density of just 1 W/m2, the required area would rise to more than 4 million km2 (1,544,408 square miles), roughly an equivalent of half of Brazil or the combined area of Sudan (Africa’s largest country) and Iran. These calculations indicate that deriving substantial shares of the world’s electricity from wind would have large-scale spatial impacts. Obviously, only a small portion of those areas would be occupied by turbine towers and transforming stations, so that crop planting and animal grazing could take place close to a tower’s foundations. But even when assuming a large average turbine size of 2–3 MW, the access roads (which are required to carry heavy loads, as the total weight of foundations, tower, and turbine is more than 300 tons per unit) needed to build roughly 2 million turbines and new transmission lines to conduct their electricity would make a vastly larger land claim than the footprint of the towers; and a considerable energy demand would be created by keeping these roads, often in steep terrain, protected against erosion and open during inclement weather for servicing access (Smil). The U.S. energy infrastructure, including the right of way for all high-voltage transmission lines, now occupies up to about 25,000 km2 (9,650 square miles), or 0.25 percent of the country’s area, roughly equal to the size of Vermont (Smill 2008). And the country’s entire impervious surface area of paved and built-up surface reached about 113,000 km2 (43,630 square miles) by the year 2000 (Elvidge). In contrast, relying on large wind turbines to supply all U.S. electricity demand (about 4 PWh) would require installing about 1.8 TW of new generating capacity, which (even when assuming an average of 2 W/m2) would require about 900,000 km2 of land (347,500 square miles)—nearly a tenth of the country’s land, or roughly the area of Texas and Kansas combined (Smil). In practice, the area per windmill varies quite a bit, averaging about 50 acres per megawatt of capacity because they interfere with each other and need to be widely spaced apart. That may still not be enough for maximum efficiency. More recent research at Johns Hopkins University by Charles Meneveau suggests that large turbines in an array need to be spaced 15 rotor diameters apart, increasing the above examples to 185-250 acres required per installed megawatt. Note that larger turbines are not substantially more efficient than small ones, because they require proportionally more space. Remember that capacity is different from actual output. Typical average output is only 25% of capacity, so the area required for a megawatt of actual output is four times the area listed here for a megawatt of capacity. And because three-fifths of the time wind turbines produce power at a rate far below average, even more (2.5×, perhaps, for a total of 10×) — dispersed across a wide geographic area — would be needed for any hope of a steady supply. Wind power is a good example of how the target of “industrial scale” energy production is wastefully using land, and creating a public backlash against renewable energy in the process. The larger the wind turbine, the further apart they must be spaced within wind farms, and consequently the lower the energy yield per hectare of land. Working theoretically, a large wind 2.3MW turbine (such as a Nordic N90 turbine) spaced five hub heights apart (an average separation distance) from other turbines has a capacity of 108 kiloWatts per hectare (kW/ha). However three 850kW turbines (such the Vestas V52) would occupy the same area of land, and even though they are 40% shorter they produce more power—111kW/ha (note, this figure includes a weighting that reflects the V52’s lower height). The reason that wind farm developers are building ever larger turbines is quite simple: Whilst capital costs can be discounted over future years, maintenance costs are always at the present value. Consequently the development of fewer, larger turbines increases the power output whilst reducing maintenance costs—increasing the return on the capital invested. Taking the 111kW/ha figure as a representative energy density for wind, to match the UK’s major electricity generators 73,308 mega-Watts (MW) of net installed capacity [DUKES, 2005g], and assuming that the turbines generated for 30% of the time and that an additional 40% of capacity was required to charge batteries/fuel cells to provide a continuous power output, just over 3,000,000 hectares of turbines would be required—equivalent to around 13% of the UK’s land area. Theoretically then, we could generate our power requirements from wind turbines. But, as noted above, electricity is less than one-fifth of the UK’s total energy consumption, so this solution this would only answers a small part of the UK’s energy problem—for a total solution we’d have to densely cover half the UK’s land area in wind turbines (parliament.uk). Even in windy regions (power class 4, 7–7.5 m/s at 50 meters above ground) such as the Dakotas, northern Texas, western Oklahoma, and coastal Oregon, where wind strikes the rotating blades with power density averaging 450 W/m2, the necessary spacing of wind turbines (at least five, and as much as ten, rotor diameters apart, depending on the location, to reduce excessive wake interference) creates much lower power densities per unit of land. For example, a large 3 MW Vestas machine with a rotor diameter of 112 meters spaced six diameters apart will have peak power density of 6.6 W/m2, but even if an average load factor were fairly high (at 30%), its annual rate would be reduced to only about 2 W/m2 (Smil). Gearbox Reliability. A 2013 summary of insurance claims revealed that the average total cost of a gearbox failure was $380,000. An analysis of 1000 turbines over a 10-year period reported that 5% of turbines per year required a gearbox replacement . Gearbox reliability remains a challenge for utility-scale wind turbines. Generator Reliability. A generator failure in 2013 was estimated to cost $310,000, while an estimated 3.5% of turbines required a generator replacement. Rotor Reliability. Average replacement costs for a blade failure are estimated at $240,000, with 2% of turbines requiring blade replacements annually. With larger blades being used on wind turbines, weight and aeroelastic limitations have put added pressure on blade design and manufacturing, which may be one of the explanations for the uptick in rotor-driven downtime. Blade failure can arise from manufacturing and design flaws, transportation, and operational damage. Manufacturing flaws include fiber misalignment, porosity, and poor bonding. During transport from the manufacturing plant to the wind plant site, blades can undergo several lifts, which result in localized loads that can cause damage if not properly executed. Operational damage is primarily related to either lightning strikes or erosion of blade leading edges. 2016-11-15. Phys.org. Original paper: Lee M. Miller et al. Wind speed reductions by large-scale wind turbine deployments lower turbine efficiencies and set low generation limits, Proceedings of the National Academy of Sciences (2016). Every turbine removes energy from the winds, so that many turbines operating over large scales should reduce wind speeds of the atmospheric flow. With many turbines, this effect should extend beyond the immediate wake behind each turbine and result in a general reduction of wind speeds. This wind speed reduction is critical, as it lowers the amount of energy that each turbine can extract from the winds. Dr. Lee Miller, first author of the study, explains: “One should not assume that wind speeds are going to stay the same with a lot of wind turbines in a region. Wind speeds in climate models may not be completely realistic, but climate models can simulate the effect that many wind turbines have on wind speeds while observations cannot capture their effect.” The wind speed reduction would dramatically lower the efficiency by which turbines generate electricity. The authors calculated that when wind energy is used at its maximum potential in a given region, each turbine in the presence of many other turbines generates on average only about 20% of the electricity compared to what an isolated turbine would generate. On land, they determined that only 3-4% of land areas have the potential to generate more than 1.0 watt of electricity per square meter of land surface, with a more typical potential of about 0.5 watt per square meter or less. 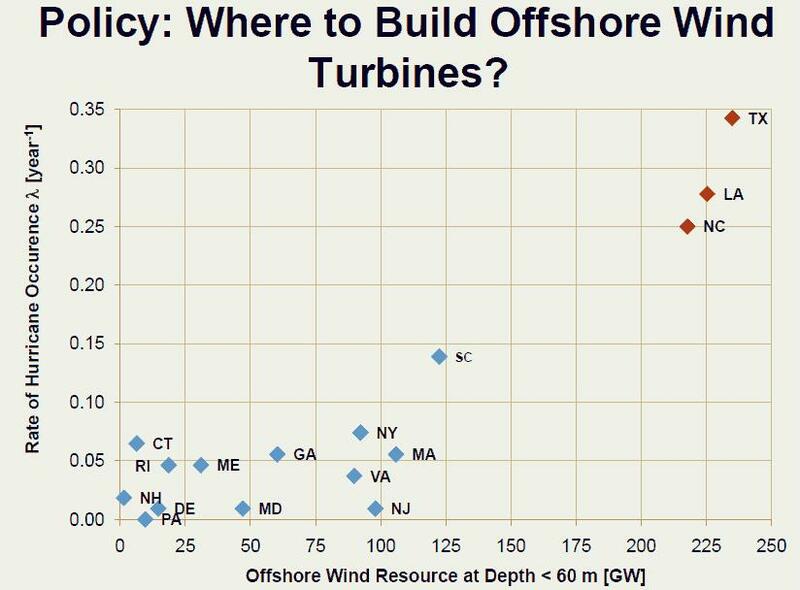 The U.S. Department of Energy has estimated that if the United States is to generate 20% of its electricity from wind, over 50 GW will be required from shallow offshore turbines. Hurricanes are a potential risk to these turbines. Turbine tower buckling has been observed in typhoons, but no offshore wind turbines have yet been built in the United States. In the most vulnerable areas now being actively considered by developers, nearly half the turbines in a farm are likely to be destroyed in a 20-year period (Rose). Source: Rose, S. 2 June 2011. Quantifying the Hurricane Risk to Offshore Wind Turbines. Carnegie Mellon University. During summer and early fall, global circulation brings frequent hurricanes that can affect the coastal and nearby inland regions extending from Texas to Nova Scotia. These would require repeated shutdown of all wind-generating facilities for a number of consecutive days and would repeatedly expose all turbines and their towers to serious risk of damage and possible prolonged repairs. One can argue that turbines should simply not be sited in these risky regions and that the needed power should come from the continent’s interior, where the machines would not be exposed to hurricanes, though they would remain vulnerable to frequent tornadoes (Smil 2010). Wind turbines are lightning magnets which can cause a great deal of damage. Blades explode; generators and control system electronics fry. And climate change is expected to increase lightning by 50%. The taller the windmill the more energy that can be captured since the strongest winds are at great heights, but lightning dangers increase with turbine height. According to a German study, lightning strikes accounted for 80% of wind turbine insurance claims. During its first full year of operation, 85% of the down time experienced by one southwestern commercial wind farm was lightning-related. Total lightning-related damage exceeded $250,000. The German electric power company Energieerzeugungswerke Helgoland GmbH shut down and dismantled their Helgoland Island wind power plant after being denied insurance against further lightning losses. They had been in operation three years and suffered more than $540,000 (USD) in lightning-related damage. BLADE DAMAGE: A lightning strike to an unprotected blade will raise its temperature tremendously, perhaps as high as 54,000° F (30,000° C), and result in an explosive expansion of the air within the blade. This expansion can cause delamination, damage to the blade surface, melted glue, and cracking on the leading and trailing edges. Much of the damage may go undetected while significantly shortening the blade’s service life. One study found that wood epoxy blades are more lightning-resistant than GRP/glass epoxy blades; damage to generators; and batteries can be destroyed, or even detonated, by a lightning strike. Even near lightning strikes weaken the blades and other components leading lead to serious turbine damage and downtime. See “In energy policy, Minnesota “Green” energy fails every test” or the original research paper “Energy Policy in Minnesota: The High Cost of Failure“. Building and maintaining a turbine requires heavy equipment that damages tiles under fields, which affects drainage in surrounding fields. Drainage problems can hurt crop yields and even stop a farmer from being able to plant in the first place. A turbine also makes it more difficult, or sometimes impossible, for crop dusters to fly over fields around it in order to spray pesticides that protect their crops Mensching 2017). Offshore windmills are battered by waves and wind, and ice is also a huge problem. They must be much more reliable due to their vastly more challenging accessibility, rely on subsea power cable networks and substations far from land; and are coupled to a range of support structures, including floating systems that are highly dependent on water depth (DOE 2014). Offshore windmills need special new vessels because offshore turbines are much larger than onshore, with cranes with maximum lift heights approaching 130 m and lifting capacities between 600 and 1,200 tons, blade lengths up to 80 meters, and rotors u to 165 meters using state-of-the-art composite fabrication facilities and extra special attention to ship blades to the project site. In the United States more than 60% of the offshore wind resource lies over water with depths of more than 60 m, but Offshore windmills need to be in water 60 meters or less. In 2008, all installations were in shallow water less than 30 meters deep. Offshore windmills need to exist in water that’s 60 meters or less. Fifteen meters or less is ideal economically, as well as making the windmills less susceptible to large waves and wind damage. But many states along the west coast don’t have shallow shelves where windmills can be built — California’s best wind, by far, is offshore, but the water is far too deep for windmills, and the best wind is in the northern part of the state, too far away to be connected to the grid. Offshore windmills are a hazard to navigation of freighters and other ships. The states that have by far the best wind resources and shallow depths offshore are North Carolina, Louisiana, and Texas, but they have 5 or more times the occurrence of hurricanes. As climate change leads to rising sea levels over the next thousand years, windmills will be rendered useless. Offshore windparks will affect sediment transport, potentially clogging navigation channels, erosion, depositing of sediment on recreational areas, affect shoreline vegetation, scour sediments leading to loss of habitat for benthic communities, and damage existing seabed infrastructure. Building windmills offshore can lead to chemical contaminants, smothering, suspended sediments, turbidity, substratum loss, scouring, bird strikes, and noise. There is a potential for offshore wind farms to interfere with telecommunications, FAA radar systems, and marine communications (VHF [very high frequency] radio and radar). Floating offshore turbines, tethered to fixed spots on the ocean floor rather than mounted directly to the seabed, exist only in prototype and concept stages of development. In addition to withstanding the greater corrosive properties of the marine environment, offshore turbines must be capable of withstanding a more complex structural vibration environment. Fleet availability has generally been lower and O&M costs higher for offshore installations. Further complicating offshore operations is the fact that maintenance access is more difficult and costly. In addition, balance-of-station costs in the form of complex foundations and underwater power collection and transmission systems are much greater for offshore wind energy projects (NREL 2014). Installing offshore windmills requires excavation of the seafloor to create a level surface, and sinking the 250 to 350 ton foundations into the seabed, which are very expensive to build,since they require scour protection from large stones, erosion control mats, and so on. Wind turbine foundations can affect the flow velocity and direction and increase turbulence. These changes to currents can affect sediment transport, resulting in erosion or piles of sediments on nearby shorelines. Modified currents also could change the distribution of salinity, nutrients, effluents, river outflows, and thermal stratification, in turn affecting fish and benthic habitats. Changes to major ocean currents such as the Gulf Stream could affect areas well beyond the continental United States, affecting the climate of North America as well as other continents (Michel). Corrosion costs aren’t added in either. Offshore windmills will be subject to a tremendous amount of corrosion from the salt water and air. Wind mills are battered year round by hail storms, strong winds, blizzards, and temperature extremes from below freezing to hundred degree heat in summer. Corrosion increases over time. The same windmill can be beaten up variably, with the wind speed at the end of one blade considerably stronger than the wind at the tip of the other. This caused Suzlon blades to crack several years ago. Complexity: A windmill is only as weak as it’s weakest component, and the more components a windmill has, the more complex the maintenance. Wind turbines are complex machines. Each has around 7,000 or more components, according to Tom Maves, deputy director for manufacturing and supply chain at the American Wind Energy Association (Galbraith). Maintenance costs start to rise after 2 years (it’s almost impossible to find out what these costs are from turbine makers). Vibration and corrosion damage the rotating blades, and the bearings, gear boxes, axles, and blades are subjected to high stresses. Gearboxes can be the Achilles’ heel, costing up to $500,000 to fix due to the high cost of replacement parts, cranes (which can cost $75,000-$100,000), post installation testing, re-commissioning and lost power production. If the electric grid were to be built up enough to balance the wind energy load better, the windmills breaking down in remote locations would require a huge amount of energy to keep trees cut back and remote roads built and kept up to deliver and maintain the turbine and grid infrastructure. Windmills wear out from ice storms, hitting insects, dust and sand abrade the blades and structure, and so on. Investment in wind power is falling worldwide, especially in developing countries like China, which stopped building new turbines last month because most of the energy was being wasted. Wind power capacity is growing slowly because large numbers of people simply cannot get much of their electricity from wind. Hundreds of wind turbines in the Netherlands are operating at a loss and could soon be demolished, according to an article published Thursday by the Dutch financial newspaper Financieele Dagblad. Subsidies for generating wind energy aren’t cost effective anymore, according to the paper’s analysis. Most of Europe’s modern wind turbines are struggling to be profitable due to the inefficient subsidy structure. Financieele Dagblad is extremely worried about the failure of the Dutch wind industry, because the Netherlands is already behind its green energy targets. Dutch financial issues with wind power aren’t unique to the Netherlands. Globally, the wind power industry is slowing down and will continue to slow, according to a 2015 report by the International Energy Agency. The wind industry is growing the slowest rate in years due to changes in the structure of subsidies, issues with reliability, and consistently high prices. The best sites with class 4+ wind (good to superb) near transmission and cities are gone. Wind Turbines to capture class 3 (fair) or class 4+ at 100 meters are too big for roads and rail. The Department of Energy would like to make wind turbines 140 meters or higher to capture the greater windspeeds at that height, but limits to growth are already being hit for 100 meter turbines. Wind blades over 53 meters (174 feet) too big for roads. Source: DOE. 2014. Wind vision: a new era for wind power in the U.S. The U.S. market has expanded to include lower wind speed sites (average wind speeds <7.5 m/s) closer to population centers. This is in part because of technological advancements and policy drivers. In some regions, it is also due to limited access to available transmission lines. As a result, from 1998 to 2013, the average estimated quality of the wind resource at 80 m for newly installed wind projects dropped by approximately 10%. This trend has increased the complexity and cost of transportation logistics because components such as blades and towers have increased in size to capture the resource at lower wind sites. As a result, existing transportation infrastructure is increasingly impacting component designs to balance energy production with transportability. Useful energy increases with the square of the blade length, and there’s more wind the higher up you go, so ideally you’d build very tall wind towers with huge blades. But conventional materials can’t handle these high wind conditions, and new, super-strong materials are too expensive. Transportation Logistics. Installed turbine power ratings have continued to rise, to an average of 1.95 MW in 2012 including multiple models at more than 2 MWs and above . As OEMs seek to capture more wind at lower wind speed sites, average rotor diameters have increased rapidly. Tower components have also increased in size and weight to access better winds higher above the ground. 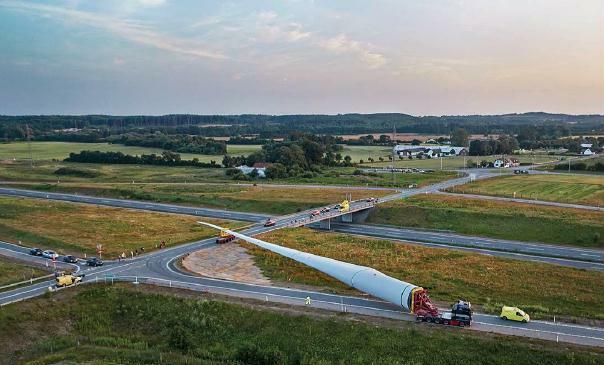 Wind turbine blades longer than 53 m begin to present a transportation obstacle due to the large turning radius, which hinders right of way or encroachment areas within corners or curves on roads or railways. Tower sections are generally limited to 4.3 m in diameter, or 4.6 m where routes permit, to fit under overhead obstructions. Design Impacts. Transportation constraints increasingly impact the design of wind turbine components, leading to higher capital costs resulting from suboptimal design. A prime example can be found in the industry-standard rolled steel wind turbine towers, which are limited to a structurally sub-optimal 4.3 meters (14.1 feet) diameter to comply with size and weight limits of U.S. roads. While it is possible to construct towers with hub heights up to 160 m at this constrained diameter, this height results in an exponential increase in the mass and cost of rolled steel towers as shown below. Figure 2-39. 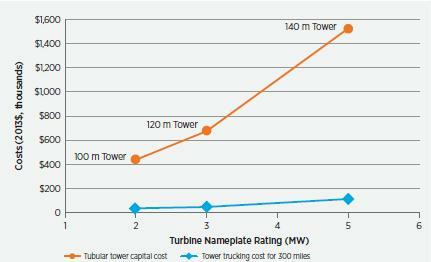 Estimates of trucking and capital costs for conventional tubular towers, 2013. Source: DOE. 2014. Wind vision a new era for wind power in the U.S.
As towers get to be 100 meters high and more, and blade length increases, shipping them gets challenging. Trucks carrying big towers and blades must sometimes move with police escorts and avoid certain overpasses or small roads (Galbraith). Installation. Because of the lift height and mass, hoisting a wind turbine nacelle onto its tower requires the largest crane capacity of all wind turbine construction and installation phases. The masses of a 3-MW nacelle assembly and a 5-MW nacelle assembly are approximately 78 metric tons (t) and 130 t, respectively, without the gearbox and generator (104 t and 173 t with those components installed). Continued increases in tower heights and machine ratings are driving higher nacelle and blade weights. As a result, the availability, scheduling, and logistics of larger cranes have become increasingly challenging. Because mobile cranes capable of installing the majority of turbines deployed in the United States are of a common size used for construction and other industries, an ample supply of such cranes existed into 2014. As the number of turbines installed at 100 m hub heights and above has increased, however, concerns about the availability of larger capacity cranes has grown. Another challenge with larger crane classes is difficulty transporting them to and maneuvering them within the wind plant, especially in complex terrain. A 1,600-ton crane has a width of nearly 13 m (41 feet), wider than a two-lane interstate highway (including shoulders), and requires more than 100 semi-tractor trailers to transport it between projects. This makes transportation between turbines difficult and costly. Over-the-road transportation has limitations because of the length, width, height, and weight of loads that vary across the United States (Table E-5). Most nacelles and large components are shipped on common 13-axle trailers, which have a load constraint of about 165,000 pounds. As weights move above that threshold, the number of available trailers drops dramatically and the use of dual-lane or line trailers is required. These trailers have diminishing returns in terms of cargo capacity because they are heavier. For example, the capacity of a 19-axle trailer (the largest conventional trailer) is approximately 225,000 pounds (102 metric tonnes), which is roughly equivalent to a 4-MW wind turbine nacelle with the drive train removed. Wind turbine blades above 53 m in length also present a transportation obstacle due to the large turning radius, which hinders right-of-way or encroachment areas within corners or curves. Blade and tower transportation barriers are caused by the difficulty of trucking long blades with wide chords on U.S. roads (in the future, transportation of large diameter root sections will have similar concerns). This barrier limits the length of blade that can be transported over roadways to 53–62 m, depending on design characteristics of the blade, such as the amount of pre-curve and type of airfoils used in the region of the maximum chord dimension. In addition to the physical limits, each state along a transportation route has different permit requirements. This problem is exacerbated by higher volumes of shipments to wider locations as wind turbine deployments have increased in number. States are also shifting the burden of proof for the safety of large high-volume shipments onto the wind industry. The increased complexity and resulting costs and delays associated with these challenges have led the American Wind Energy Association’s Transportation & Logistics Working Group to coordinate with the American Association of State Highway and Transportation Officials in standardizing the permitting process across states. Constraints on road transport have also led to an increased use of rail as an alternative for heavy wind components, such as the nacelle; high-volume components; and long-distance shipments. Rail is capable of shipping very heavy loads, greater than 163 metric tonnes, and does not generally require permits for each state. However, rail imposes its own length and width constraints and is not available in every location in which wind energy is being developed. Trade-offs between rail and road transportation can also be constrained by cargo widths. Rail clearances are affected by overall shape of the cargo but begin to be restrictive on widths greater than 4.27 m (14 feet [ft]). Road transportation is subject to lane clearing constraints on loads exceeding 4.11 m (13 ft, 6 inches). A few select lanes can be cleared for widths up to 4.57 m (15 ft) for towers, but this is not a common occurrence. Road transport cost is affected by width but roads are generally capable of moving widths up to 4.87 m (16 ft). Widths in excess of 3.66 m (12 ft) require escorts. Widths in excess of 4.57 m (15 ft) may also include police escorts, which escalate cost and complexity. Height can be a challenge in road transport, but rail is often capable of accommodating tall cargo without issue. Most wind turbines require a loaded height (cargo plus trailer deck height) of 4.72–4.77 m (15 ft, 6 inches–15 ft, 8 inches) in order to clear the tallest cargo (e.g., the nacelle or tower). This height is often at the upper limits of many areas of the country for road transport. Tower diameters that exceed 4.57 m (15 ft) often complicate the ability to find a clear route to site. The numbers in this section are representative constraints; specific routes around the country may be more or less restricted. The key point is that transportation logistics issues are increasing, which can cause delays and added costs, as well as suboptimal component design. Crane Availability. The availability of smaller (120–150 metric tonnes) “support” crawler cranes may also become more limited as the number of installed turbines increases. These small cranes are used to off-load turbine components, and to support the larger cranes required for the heaviest of nacelles or greater than 100-m hub-heights. These small crawlers are used in all forms of construction, especially infrastructure, and as infrastructure projects gain momentum, the supply of these cranes should increase. With the decline in wind installations in 2013, crane manufacturers have realigned to supply ultra-large crawler cranes to the power generation and petro-chemical facilities. While development of machines to improve capacities at heights required by the wind industry continues, the pace of such investments has fallen considerably. Mackay, M. 29 Dec 2012. Wind turbines’ lifespan far shorter than believed, study suggests. The Courier. A study commissioned by the Renewable Energy Foundation has found that the economic life of onshore wind turbines could be far less than that predicted by the industry. The “groundbreaking” research was carried out by academics at Edinburgh University and looked at 3,000 onshore wind turbines and years of wind farm performance data from the UK and Denmark. The results appear to show that the output from windfarms — allowing for variations in wind speed and site characteristics — declines substantially as they get older. By 10 years of age, the report found that the contribution of an average UK wind farm towards meeting electricity demand had declined by a third. That reduction in performance leads the study team to believe that it will be uneconomic to operate windfarms for more than 12 to 15 years — at odds with industry predictions of a 20- to 25-year lifespan. They may then have to be replaced with new machinery — a finding that the foundation believes has profound consequences for investors and government alike. Scotland’s landscape could be blighted by the rotting remains of a failed regeneration of wind farms, according to a scathing new report. The study estimates that routine wear and tear will more than double the cost of electricity being produced by wind farms in the next decade. Older turbines will need to be replaced more quickly than the industry estimates while many more will need to be built onshore if the Government is to meet renewable energy targets by 2020. Author Prof Gordon Hughes, an economist at Edinburgh University and a former energy adviser to the World Bank, discovered that the “load factor” — the efficiency rating of a turbine based on the percentage of electricity it actually produces compared with its theoretical maximum — is reduced from 24 per cent in the first 12 months of operation to just 11 per cent after 15 years. The study also looked at onshore turbines in Denmark and discovered that their decline was much less dramatic even though its wind farms tended to be older.Prof Hughes said that may be due to Danish turbines being smaller than British ones and possibly better maintained. He said: “I strongly believe the bigger turbines are proving more difficult to manage and more likely to interfere with one another. British turbines have got bigger and wind farms have got bigger and they are creating turbulence which puts more stress on them.It is this stress that causes the breakdowns and maintenance requirements that is underlying the problem in performance that I have been seeing”. Prof Hughes examined the output of 282 wind farms —about 3,000 turbines in total — in the UK and a further 823 onshore wind farms and 30 offshore wind farms in Denmark. “Bluntly, wind turbines onshore and offshore still cost too much and wear out far too quickly to offer the developing world a realistic alternative to coal. Prof Hughes said his analysis had uncovered a “hidden” truth that was not even known to the industry. His report was sent to an independent statistician at University College London who confirmed its findings. There’s been a great deal of NIMBYism preventing windmills from being built so far. Some of the objections are visual blight, bird killing, noise, and erosion from service roads. After 25 years of marriage, I still have to sometimes go downstairs to sleep when my husband snores too loudly, so I can imagine how annoying windmill noise might be. And even more so after reading the Noise Impact Assessment Report – Waubra Wind Farm, which makes the case that windmill noise affects the quality of life, disturbs sleep, and has adverse health effects with sounds of whooshes, rumble-thumps, whining, and clunks. Low frequency sounds can penetrate walls and windows and cause vibrations and pressure changes. Many people affected would like to come up with a standard that windmill farms must be at least 2 kilometers away and not exceed a noise level of 35 dB(A) at any time outside neighboring dwellings. The Sierra club in Maine is asking the Minerals Management Service to look at over a dozen aspects of wind offshore, including possible interference with known upwelling zones and/or important circulatory and current regimes that might influence the distribution or recruitment of marine species. Wind affects the upwelling of nutrients and may be a key factor in booms and busts of the California sardine fishery and other marine species. Fishermen are worried about the impact offshore wind turbines will have on them, including some of the same concerns as the maritime transportation sector, including safety of navigation, ensuring turbines are spaced widely enough to allow maneuvering and the issue of misleading radar echoes that can be generating by turbine rotors. For mobile gear fishermen, there is fear that large parts of the leases could be effectively off-limits to them because towers are too close together to safely trawl of dredge. Wind power officials see a much larger obstacle coming in the form of its own work force, a highly specialized group of technicians that combine working knowledge of mechanics, hydraulics, computers and meteorology with the willingness to climb 200 feet in the air in all kinds of weather (Twiddy). We need liquid fuels for the immediate crisis at hand. Transportation, manufacturing, and 500,000 products made out of fossil fuels have no electrical processes. In the very best windmill farms, the capacity factor is only 28 to 35%. Wind turbines generate electrical energy when they are not shut down for maintenance, repair, or tours and the wind is between about 8 and 55 mph. Below a wind speed of around 30 mph, however, the amount of energy generated is very small. A 100 MW rated wind farm is capable of producing 100 MW only during maximum peak winds. Most of the time it will produce much less, or even no power at all when winds are lighter or not blowing. In reality, 30 MW of power production or less is far more likely. What wind farms actually produce is called the CAPACITY FACTOR. Quite often you will only hear that a new wind farm will generate 100 MW of power. Ignore that and look for what the capacity factor is. This makes a difference in how many homes are served. Per Megawatt, a coal plant up 75% of the time provides enough power in the Northeast for 900 homes and a wind plant up 30% of the time power for only 350 homes. The southhas extremely voracious electricity consumers, so the numbers are much lower: 350 and 180 respectively. Solar generators typically have a 25 percent capacity factor, because the generators do not produce electricity at night or on cloudy days. Where the wind blows is often far from where people live, and the cost of building transmission lines so expensive wind turbines simply won’t be built – in fact, wind often appears to be cheaper than fossil fuels because the transmission cost and balancing costs of fossils aren’t included into their actual cost. As you can see above, the wind blows the strongest in China where the fewest people live. Over time the build-up of dead insects and/or salt on off-shor turbine blades reduces power by up to 30%. According to the American Wind Energy Association, these are the challenges of small windmills: they’re too expensive for most people, there’s insufficient product reliability, lack of consumer protection from unscrupulous suppliers, most local jurisdictions limit the height of structures to 35 feet (wind towers must be at least 60 feet high and higher than objects around them like trees, etc), utilities make it hard and discourage people from connecting to the grid, the inverters that modify the wildly fluctuating wind voltages into 60-cycle AC are too expensive, and they’re too noisy. The goal of Energiewende was to make Germany independent of fossil fuels. But it hasn’t worked out. The 29,000 wind turbines and 1.6 million PV systems provide only 3.1% of Germany’s energy needs and have cost well over 100 billion Euros so far and likely another 450 billion Euros over the next two decades. And even more than that if you add in the extra cost of maintaining fossil generation systems to back up the lack of wind and sun from seconds to weeks. Because of their extremely low energy density and need for a great deal of space, forests are being cut down, pits dug, and filled with hundreds of tons of reinforced concrete for wind turbines to stand on: 5 acres per turbine. With the forest no longer protecting the soil, it is now vulnerable to wind and rain erosion. Because wind and solar farms get a guaranteed price for 20 years, they have no need to innovate, do research, or please customers, who paid them 176 billion euros for electricity with a market value of just 5 billion euros from 2000-2016. This is money that taxpayers could have used to build bridges, energy efficient buildings, or renovate schools, which would create even more jobs than the wind and solar industry (Vernunftkraft 2018). Anderson, J. March 1, 2017. You Can’t Have Offshore Wind Power Without Oil. Forbes. Castelvecchi, D. March 2012. Gather the Wind. If renewable energy is going to take off, we need good ways of storing it for the times when the sun isn’t shining and the wind isn’t blowing. Scientific American. Cembalest, Michael. 21 Nov 2011. Eye on the Market: The quixotic search for energy solutions. J. P. Morgan. Cubic Mile of Oil. Wikipedia. DATC. September 23, 2014. $8-billion green energy initiative proposed for Los Angeles. Duke American Transmission Co.
De Castro, C. 2011. Global Wind Power Potential: Physical and technological limits. Energy Policy. E.ON Netz Corp. Wind Report 2004.Renewable Energy Foundation. E.ON Netz Wind report 2005 shows UK renewables policy is mistaken. Elvidge, C. D. 2004. U.S. constructed area approaches the size of Ohio. Eos 85:233-34. Fisher, T. Oct 23, 2013. Big Wind’s Dirty Little Secret: Toxic Lakes and Radioactive Waste. Institute for Energy Research. Gattie, D. 2019. 100 percent renewable energy isn’t a response to climate change — it’s a retreat. The Hill. Gruver, M. September 24, 2014. Renewable energy plan hinges on huge Utah caverns. Associated Press. IEC. 2014. Wind speed and power. Iowa Wind Center. Martin, R. April 7, 2016. Texas and California have too much renewable energy. The rapid growth of wind and solar power in the states is wreaking havoc with energy prices. MIT Technology Review. Mason, V. 2005. Wind power in West Denmark. Lessons for the UK. Miller, L. M., et al. May 16, 2014. Two methods for estimating limits to large-scale wind power generation. Proceedings of the National Academy of Sciences. Nelder, C. 31 May 2010. 195 Californias or 74 Texases to Replace Offshore Oil. ASPO Peak Oil Review. NREL. 2014. Renewable Electricity Futures Study Exploration of High-Penetration Renewable Electricity Futures. National Renewable Energy Laboratory. Parliament.uk. 21 Sep 2005. Memorandum submitted by Paul Mobbs, Mobbs’ Environmental Investigations. Select committee on environmental audit. Pfotenhauer, N. May 12, 2014. Big Wind’s bogus subsidies. U.S. News. Radford. 2016. Renewable energy demands the undoable. Climate news network. Rose, S. et. al. 10 Jan 2012. Quantifying the hurricane risk to offshore wind turbines. Proceedings of the National Academy of Sciences. Shellenberger, M. 2019. With ethanol And biomass no longer viewed as ‘Green,’ will other renewables soon follow? Forbes. Smil, V. 2008. Energy in nature and society. MIT Press. Smil, V. 2010. Energy myths and realities. AEI press. Smith, K. J. 2016. Surge protector. Scientific American. Takemoto, Y. 31 Aug 2006. Eurus Energy May Scrap Wind Power Project in Japan. Bloomberg. Temple, J. 2018. 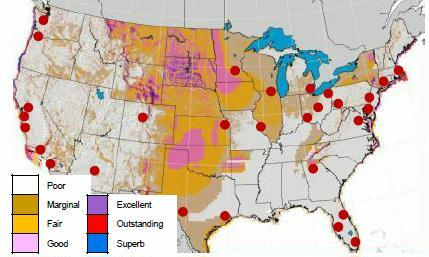 Wide-scale US wind power could cause significant global warming. MIT Technology Review. Twiddy, D. 2 Feb 2008. Wind farms need techs to keep running. Associated Press. Vernunftkraft. 2018. Germanys Energiewende – where we really stand. Bundesinitiative für vernünftige Energiepolitik, Vernunftkraft. Wiley, L. 2007. Utility scale wind turbine manufacturing requirements. Presentation at the National Wind Coordinating Collaborative’s Wind Energy and Economic Development Forum, Lansing, Mich., April 24, 2007. Clover, C. 9 Dec 2006. Wind farms ‘are failing to generate the predicted amount of electricity‘. Telegraph. Means, E. Jan 12, 2015. Scotland Gagging on Wind Power. Energy Matters. Blackwell, R. Oct 30, 2005. How much wind power is too much? Globe and Mail. Wind power has become a key part of Canada’s energy mix, with the number of installed wind turbines growing exponentially in recent months. But the fact the wind doesn’t blow all the time is creating a potential roadblock that could stall growth in the industry. Alberta and Ontario, the two provinces with the most wind turbines up and whirling, face concerns that there are limits on how much power can be generated from the breeze before their electricity systems are destabilized. Alberta recently put a temporary cap on wind generation at 900 megawatts — a level it could reach as early as next year — because of the uncertainty. And a report in Ontario released last week says that in some situations more than 5,000 MW of wind power, stable operation of the power grid could be jeopardized. Warren Frost, vice-president for operations and reliability at the Alberta Electric System Operator, said studies done over the past couple of years showed there can be problems when wind contributes more than about 10 per cent of the province’s electricity — about 900 MW — because of the chance the wind could stop at any time. Each 100 MW of wind power is enough to supply a city about the size of Lethbridge, Alta. If the power “disappears on you when the wind dies, then you’ve got to make it up, either through importing from a neighbouring jurisdiction or by ramping up generators,” Mr. Frost said. But Alberta is limited in its imports, because the provincial power grid has connections only with British Columbia and Saskatchewan. And hydroelectric plants with water reservoirs, which can turn on a dime to start producing power, are limited in the province. Coal-fired plants and most gas-fired plants take time to get up to speed, making them less useful as backups when the wind fails. There can also be a problem, Mr. Frost noted, when the wind picks up and generates more power than is being demanded — that potential imbalance also has to be accounted for. There are a number of ways to allow wind power to make up a greater proportion of the electricity supply, but they require more study, Mr. Frost said. First, he said, the province can develop more sophisticated ways of forecasting the wind so the power it generates is more predictable. The province could also build more plants that can quickly respond if the wind dies down during a peak period, for example. But building new gas-powered plants merely to help handle the variability of wind is certain to raise the ire of environmentalists. The province could also increase its connections to other jurisdictions, where it would buy surplus power when needed. Alberta is already looking at links with some northwestern U.S. states, including Montana. Over all, Alberta is committed to “adding as much wind as feasible” Mr. Frost said. “What we’re balancing is the reliability [issue]. Robert Hornung, president of the Canadian Wind Energy Association, which represents companies in the wind business, said he prefers to think of Alberta’s 900 MW limit as a “speed bump” rather than a fixed cap. “We have every confidence they’ll be able to go further than that,” Mr. Hornung said, particularly if the industry and regulators put some effort into wind forecasting over the next year or so. That’s crucial, he said, because “we have projects of many, many more megawatts than 900 waiting to proceed in Alberta. In Ontario, the situation is less acute than in Alberta, but the wind study released last week — prepared for the industry and regulators — shows some similar concerns. While wind power could be handled by the Ontario grid up to 5,000 MW — about 320 MW of wind turbines are currently in operation with another 960 MW in planning stages — the situation changes at higher levels, the study suggests. Particularly during low demand periods when wind makes up a relatively high proportion of the power mix, “stable operation of the power system could be compromised” if backup systems can’t be ramped up quickly to deal with wind fluctuations, the report said. But Ontario is in a better position than Alberta because it has far more interconnections with other provinces and states, where it can buy or sell power. And it also has its wind turbines more geographically dispersed than Alberta, where most wind farms are in the south of the province. That means the chance of the wind failing everywhere at the same time is lower in Ontario. Don Tench, director of planning and assessments for Ontario’s Independent Electricity System Operator, said he thinks better wind forecasting is the key to making the new source of power work effectively. “If we have a few hours notice of a significant wind change, we can make plans to deal with it,” he said. Mr. Frost, of the Alberta system operator, said European countries such as Denmark and Germany have been able to maintain a high proportion of wind power in their electricity systems mainly because they have multiple connections to other countries’ power grids. That gives them substantial flexibility to import or export power to compensate for wind fluctuation. Germany, for example, has 39 international interconnections, he said, making variable wind conditions much easier to manage. This entry was posted in Alternative Energy, Energy, Wind and tagged alternative energy, electric grid, energy storage, EROEI, EROI, national grid, seasonal, wind power, wind turbine. Bookmark the permalink. When a trillion dollar programme in the size of the wind turbine industry , based on broken physics, becomes executed, hyped by studies, researches, reports, editorials, talks, presentations, TV programs, web sites, support from the UN, governments and other bodies – that run their engines of messaging on millions of computer machines, land and satellite networks, transportation, mining, industrial activities for years, 24/7 – yet to prove that wind energy is an energy sink – how to pay off for all the finite fossil fuels supplies that were burned to fuel all that show? The once-only fossil fuels burned in this energy-intensive exercise have taken several folds more fossil fuels supplies to extract from deep in the ground. Who has paid and paying for all that massive trail and bleeding of fossil fuels supplies burned in childishly-experimenting with wind, solar, nuclear, fusion, hydro, quantum and similar? Who on earth has sold and selling his own national finite, once-only fossil fuels reserves, and has burned and burning more of those reserves to extract and export excess supplies wasted in any of those projects – unpaid or at least unpaid for the future potential of the reserves? Or, could it be that all fossil fuels supplies burned into steam, wind, solar, nuclear, fusion, quantum, weapons, wars and other energy programms, since the days of coal in 1700s Britain, are and were all – looted?! Street riots in Basrah, Iraq, a hub of extracting and exporting millions b/d of oil – protesting against ill basic services, violence, poverty, poor or non-existent grid power since 2003 war, environmental pollution, unemployment, highest rates or cancer, systemic drugs trades and distribution…(below link). What remains of fossil fuels reserves in Basrah and others today are probably still be enough to propel humanity for another thousand years of dignified modest living standards if the world acknowledges the fact that humans can not manufacture energy and they have to give up the shenanigans of wind, solar, nuclear, hydro, fusion, Tesla, quantum, space colonies and similar ‘energies’ – to save what remains of finite fossil fuels going to waste. Will the world ever see the upper Invisible Hand of Adam Smith, Marx’s Economics, Huxley’s Overorganisation and Social Engineer giving up their stupidity and start trading fossil fuels on the basis they are finite, not on the basis of supply-and-demand – before the last drops of crude oil are burned in vain or self-destruction? The majority of locals in Iraq think, no! On the contrary, they see that ‘Adam Smith’ and ‘Huxley’ look determined to now hand over all remaining oil reserves to warlords and their militant militias, so they smuggle oil supplies un-audited, for all broken-physics programms like wind, solar, fusion energy, tar sand oil, shale oil and similar others to continue for more decades to come! What a waste of millions-of-years-in-the-making gold-grade finite fossil fuels, all this is – indeed? !